We are creating practical tips and tricks to help you be a better machine knitter. View Machine knitting blankets is more than just rectangles. Let's talk about making larger sizes, alternative shapes and interesting construction techniques. Are you willing to do what it takes to "translate"? The humble I-Cord (slip cord) can be used for so much more than ties and straps. From decorative to functional uses, let's talk about I-Cord! Did you know you can cast on and bind off with I-Cord? What about slip cord for a finish-as-you-go edge to your knitting? It uses I-cord in the seam as an embellishment. View Knitting V-neck sweaters isn't hard ... perfecting the finishing can be a challenge. View Break out of the ribbing rut! Your cuffs and welts don't HAVE to be ribbed! View Where do you turn for knitting patterns? With so many choices, do you get confused by pattern styles and terminology? View Let's talk Tuck! A basic technique that can be worked on any knitting machine. Tuck ads texture and width and the possibilities are nearly endless! Manual Machine, Punchcard or Electronic ... you CAN knit Tuck! View Let's talk Stitch Patterning! This week's Knit Club was cancelled. Last week's Knit Club scratched the surface of knitting in pattern on the machine. View Let's explore automatic stitch patterning. Punchcards, electronics, tuck, lace, slip, fairisle, weaving... so many choices so little time! View Are you new to MKing? Are you stuck in a rut with the basics? Let's look at all the different ways to start and end your knitting. View Raglan Sleeve Sweaters are knitters' favorites. This week, let's talk Raglans! View Knitting perfect set in Sleeves just takes practice. View As machine knitters, we spend a lot of time knitting rectangles and squares. Knitting circles opens up a world of design possibilities. Let's explore some circular inspiration! Very few adult women today will fit into the vintage patterns written for 32" bust. Let's talk about options for knitting for today's woman. Did you accomplish what you set out to do with your knitting machine this year? Are you happy with the progress you are making? This will be the last LIVE for 2018 ... we'll resume on Tuesday, January 8 (same time, same place) ... Happy Holidays! View We've all had them ... disasters! Dry your tears and LEARN from your disasters. Before you "frog" it (or toss it) - take time to examine what went wrong. View The often over-looked technique of Knitweave creates beautiful knitted fabrics with lots of possibilities. Unlike traditional weaving, think of weaving on the machine as "laying-in" a second yarn on top of the knitting. 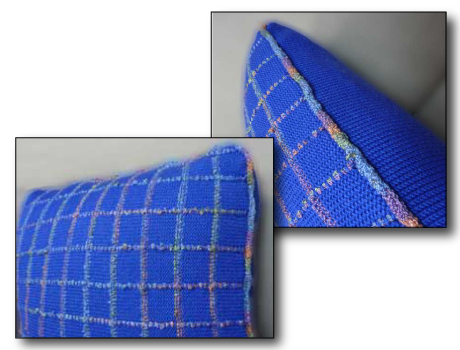 It is a decorative technique that can be used to create interesting textures with any machine and incorporate yarn that may not be suitable for your machine. Have a small amount thick, fancy (possibly expensive) yarn? Use it in your machine knitting with Knitweave! View Do you find yourself saying "I just don't have time for knitting"? This seems to be a common thread in the Knit Club Forum recently. Let's put our heads together and share tips for how YOU get things done and MAKE time for your favorite hobby. View What could be more fun than knitting for babies? Sweaters and blankets can provide for quick knitting and allow for your creativity! Knit it Now offers, courses, patterns, and inspiration for baby knitting. Check what Knit it Now has available for you. Let's talk about knitting for babies! Why did you join Knit it Now? Why do you follow us? What are your machine knitting goals? We changed today's topic from the baby sweater ... if you are interested, please contact me directly. Do I need special yarn for my machine? What yarn can I use with my machine? Do I have to re-wind yarn in balls or center pull skeins? If you are an experience knitter, please join in with your words of wisdom for other knitters. View Cables are traditional favorites of knitters both hand and machine. You CAN knit cables on the machine ... no matter what machine you have. View Maybe you're considering purchasing a ribber for your machine or maybe you have one and haven't used it. Let's talk about how adding a ribber to your MK setup can expand your horizons. Did you know you can do much more than plain 'ol 1x1 ribbing? View DesignaKnit and Garment Designer are both excellent software packages that are useful for your machine knitting. This is NOT a sales pitch for either package. The focus will be on helping you determine IF software can help you be a better knitter. View Fast Knitting - Creative Canvas - Useful project! Not too short, not too long ... just right length. Off the shoulder or neck close warmth. Make your poncho the way YOU want it PLUS use any machine, any yarn and any stitch pattern! View Mock ribbing is a technique that often gets overlooked. Let's look at this versatile and useful technique with fresh eyes. View Add a soft, flattering touch to the hems of your sweaters. Curve the sides with short row shaping.Work the hem finish of your choice, then shape the sides for a designer touch. View Thanks to all of our subscribers, new and returning! We are releasing our newest bonus course that will inspire machine knitters of all skill levels. In the show this week, we'll talk about the the new course and all of the benefits of a Knit it Now Subscription, including some hidden "Easter Eggs" that you may not know are available to you. View What are YOUR favorite books for knitting? ... both machine and hand. We have a few that are on top if the stack ... what what are yours? View After shaping necklines, adding neckbands is probably the most challenging part of machine knitting sweaters. View It's never too early (or late) to start Christmas knitting. Let's talk stockings! Can't wait till Tuesday? Check out the Knit-1 eBook Christmas Socks Ready for immediate download. View To successfully knit garments it takes more than just throwing yarn at the machine and hoping for the best. For machine knitters, the actual knitting can take less time than the planning and preparation. Let's talk about the steps to take that will make your next project an all-around success! View Newbie or experienced, sometimes all we want is a quick, practical SUCCESS! Machine knitting doesn't have to involve days of planning. We do this to get done QUICK! Let's talk about fun, easy and quick projects that any MKer can knit. View When you got started machine knitting, what is the ONE thing you wish you knew? Many of us are "self-taught" picking up bits and pieces of information here and there. If you could share just ONE thing with a newbie ... what would it be? View Stockinette, Slip, Tuck, Lace all make beautiful fabrics. Each has it’s own characteristics, but which one uses more yarn? Follow along on our experiment. We have a partial cone of yarn ... which stitch type would make the best use of the yarn we have available? View Sneak Preview of our newest course. Do hesitate to knit sweaters for you because they don't fit? Are you frustrated with using different charting method or patterns? Would you like to discover a pattern that is a "blueprint" made JUST FOR YOU? Perfect Fit™, to knitting and finishing a sweater you will wear! View Let's talk about alternative ravel cord materials and uses for a machine knitters best friend ... ravel cord. View If you've been knitting for a while, you may have acquired some "skinny" yarn. Too fine to knit alone, what can you do with it? Let's explore some techniques that put "skinny" yarn to use! View How to know how much yarn to purchase for a project? When knitting with cones, the decision is usually do I need 1 or 2 cones? Since we've been using more and more hand knitting yarn, a more accurate estimate is needed. Let's talk about yarn estimates ... from guessing to knowing for sure! View We're taking some time out of the office ... let's talk machine knitting ... from Oakland! View Adding a hood to any sweater pattern can be easy. There are a few things to consider when designing a hood ... especially for machine knitters. This overview will give you confidence to create your own custom hoodie sweater! View You just ripped out a row of knitting, or put some knitting back on the bed from waste yarn or the garter bar. Perhaps you did a bit of shaping and now your carriage is on the opposite side of the working yarn. Positioning the carriage is an essential skill for machine knitters. View This is a hand-manipulated, lacy, openwork technique that can be done on any knitting machine, with any yarn. No punchcards or programming. It's reversible, making it a great choice for scarves or shawls. Watch as we work the partial knitting that makes this so beautiful! This hand manipulated stitch pattern is a great way to gain confidence with your machine. View The back and front of our sweaters don't have to match. If we are knitting to cover a body shape that isn't quite perfect ... we may need to add both length and width to the front only. View New Course! Learn to get great fit with any knitting pattern. Make it fit YOU! View The width of knitting produced by our machines is limited to the number of needles available on the machine. Lets talk about a few ways to work around the needlebed size limitation. View "I hate hung hems"! Let's look at 3 ways to make hung hems not only acceptable, but exceptional! View Machine knitters can get things done ... fast! Why not dedicate some time to create something fabulous and hone your skills at the same time? Check out our newest "Weekend Project" with lots of options for making it your own! View It's happened to us all ... the work drops off the machine (always at the worst moment). We drop stitches or knit in a knot. Don't feel alone! Take a deep breath, take a walk and come back to the machine with fresh eyes and "just do it" to get back on track. View A quick visit to Stitches West knitting conference. View You are the designer! Use the Knit it Now "Blueprint" and course. You'll have all the instruction and tools to create an heirloom tree skirt for your family.